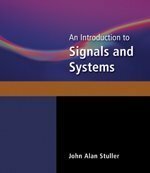 This book provides a concise and clear introduction to signals and systems theory, with emphasis on fundamental analytical and computational techniques. Introduction to Signals and Systems develops continuous-time and discrete-time concepts/methods in separate chapters - highlighting the similarities and differences - and features introductory treatments of the applications of these basic methods in such areas as filtering, communication, sampling, discrete-time processing of continuous-time signals, and feedback. This text is written for introductory courses in continuous-time and/or discrete-time signals and systems for Electrical Engineering students. It is also accessible to a broad range of engineering and science students, as well as valuable to practicing engineers seeking an insightful review. Dr. John A. Stuller is Professor Emeritus in Electrical and Computer Engineering at Missouri University of Science and Technology.